There are so many things I want to write about today. So many. The problem is, I'm not sure if any of them are even remotely of interest to anyone besides myself. So, I'm at a bit of a crossroads on this one. Lemme just back up a minute first, though. Nathaniel and I started this blog to express and to share our love of all things geeky (and ridiculous! ), but we also agreed that sometimes it's okay to post some of the more personal stuff to the blog. Not always, but sometimes. Often, when I do just that, this blog serves as a great way for me to vent and to type until my fingers hurt and I don't want to type, or to think, any more. And sometimes that's exactly what the doctor ordered. So, since it's the end of the year, and because I really do want to at least mention some of these things as a--I dunno, a record of some sort--I guess I'll proceed (with some caution). As you all know (and as I've made you all painfully aware over these past few months), I lost my job back in September and I've been diligently trying to find steady work ever since. Aside from several freelance gigs here and there, though, I've pretty much had an epic fail in this regard. And that's made me moody and angrier than I normally am, and I hate that. But I don't do well with sitting idly by, especially when I feel like I'm at an age where steady, career-driven work is crucial for my future. I have four years of experience in the publishing field--which doesn't sound like a lot. But, being that I'm out of college five years...well. There isn't much more professional experience I could have accrued during that time. But, because of several factors--this recession the main one--I am constantly up against people who have ten, twenty, thirty, or in some cases, forty and fifty, years of experience in the field. They have literally been editing books for longer than I have been on this Earth. That's tough to compete with. With four years experience, I'm right at the cusp of being "experienced" while still being "inexperienced." Another year or two at my old job, and that would have been a moot point. 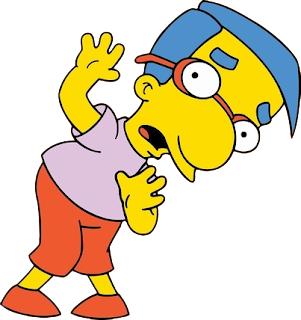 Things didn't work out that way, so as I apply for new jobs, I find myself caught in between having too much experience--for, say, an editorial assistant job--and not having enough experience--for, say, an Editor opening at a major firm. So, fine, I'm just like millions of others in this country--unemployed and trying to scratch and claw my way back into the workforce. In the meantime, I decided to do quite a bit of writing, and to focus on the possibility of getting published somewhere. And I did. Get published somewhere, I mean. Lemme explain. As I write this, I've just been informed that I've now lost my "fake job," as a Managing Editor of a magazine tie-in to a pretty big TV show. I've been "working" at this magazine since almost the day after I was laid off from my real job. I use quotes because I worked at the magazine in a volunteer capacity--which is fancy, high-falutin' talk for "unpaid." Still, it was for a TV show that I really love, and it was a great opportunity to learn a bit about the magazine business, and that end of the publishing industry. The people were great, the other editors were awesome to work with, the articles and the writers were interesting and fun and probably too good to be true. Upper management was a bit of a disaster, though. This magazine was truly a labor of love, and not what you'd call a profit maker. Still, the people involved worked on it because they wanted to be involved. However, recently, and quietly, the magazine was bought out by a new publisher, and the details of staff-related stuff was leaked online. A heck of a way to find out you just got the boot, let me tell ya. I wasn't surprised that I won't be coming back for future issues--I worked remotely, and I was the newest member of the team. I was surprised to find out about the position change on the Internet, and not from the mouth of the new publisher. I find that to be wholly unacceptable, but quite typical of upper management types. They employ workers, not people. Well, in my case, I wasn't "employed" in the classical sense of the word. I was, however, doing quite a bit of work, and editing quite a few articles, both from established staff writers and new submissions we received on a daily basis. And I was praised quite often for the job I was doing. And, as I said, I came cheap. But, still, changes came and publishers switched, and whatever. Hopefully my name will be on the masthead for the issue that I helped out with, and hopefully I'll get some recognition for my contributions. During my three months, I managed to hire a full-time staff writer. She's someone who is, now, and will continue to be, a valuable asset to the magazine, so at least there's some tangible progress left behind. I also wrote an article for the magazine. It was for their Halloween issue, and I introduced and reviewed a handful of Halloween-themed and/or horror/paranormal comics. It was met with a very positive response, and it even looked like something that was going to turn into a monthly feature. And, of course, once that article was published...I would be published. The article was written in an hour or two, after the former publisher emailed with an emergency. We'd gone to press short one spread (two pages), and we needed something. I emailed back, ptiched my idea, and wrote the story. It was approved and put into the issue. Not long after that, I was named the full-time (volunteer) Managing Editor. But the story--and the Halloween issue--were the most important things to me. I'd seen my name in books before, as an editor. And, sure, there's a two second thrill that accompanies seeing something of that nature. But it's the writer--the real creator of something, from nothing--who deserves the credit. Not the editor. Never the editor. Even on those educational books I edited for four years at my old job, some of which by rewriting everything that had been handed in by writers, it was their names that were important. The credit was theirs. And that's how it should always be. But the magazine. An article published in a magazine that's available in Borders, and Barnes & Noble, and everywhere books are sold. That issue--the Halloween issue--is still at the printer. Sitting there, in its final proof stage, waiting to be uploaded and printed and churned out and sold. There was a problem at the printer, and the magazine is delayed. It's December, so you tell me if the Halloween Special will ever be un-delayed. I hope it goes to press. I hope my little 1,200 word article sees print. I doubt it, though. I'm not sure if I'll ever be asked by this magazine to write another article, or even to edit another article. I'm not sure any of the articles I edited will end up in a future issue. Even if they do, I'm not sure my name will be anywhere near that masthead, and if it'll be as if my work was completed by an invisible hand. But I guess that's the true mark of an editor, anyway. I can tell you this, though. It's like winning a couple hundred dollars on a scratch off ticket, and then realizing that you actually didn't win. That the ticket never really existed. But, if it had, well. Let's just say, a couple hundred dollars would be nice right about now. So now it's on to the next for me. Again. My two comics--both created, written, and funded by me, mind you--are on hold. One because of a falling out with a former partner, and the other because of the same reason. There's some heated contesting of one of the properties, which has been horrible and expensive and lawyer-y. I think I might actually get into that in an upcoming post. We'll see if I'm allowed to. But for now, when I look back on the Year That Was, I guess what it comes down to is this. I had a lot of things happen to me that were beyond my control. I learned a lot about business, and more specifically, about how not to do business. And that's important, for sure. I also found out who my friends really are, and who I can count on. Speaking of friends, two of my closest got me some really great presents for Christmas this year. And, even though I promised one of them that I'd wait for him and his girlfriend before popping the Watchmen Ultimate Edition into my DVD player, I may have already watched all of the extra features. Then, when I opened the mailbox this past Friday afternoon, I found a package filled with comics. Some old, some new. And two hardcover collections--Daniel Way's second Deadpool arc and the first arc of Avengers: The Initiative. I'd read and loved all of Daniel Way's Deadpool, and I was hoping to pick up the second collection after the holidays, and most likely when it came out in paperback. As for The Initiative, it's a series I've been meaning to get into forever, and now I have. Both collections, and the single issues in the package, were great. And with the giant snowstorm we had on the East Coast last weekend, there was plenty of time to kick back and read them. So I did. And they were great. And then I thought, eh, might as well dive into the pile of unread books lying under my bed. Books going back to September and August and July and before. I made a pretty small dent in the pile, but any kind of dent at all is progress with a pile like that. So I spent Saturday and Sunday reading comics in bed. 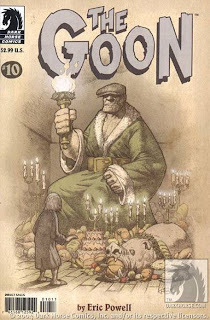 And tomorrow I'll start in on my yearly tradition of reading the entire run of The Goon, from start to finish. It hasn't been the greatest year. It hasn't even been a very good year. But it hasn't been a bad year. And that's something. That's enough. On to the next, yeah?